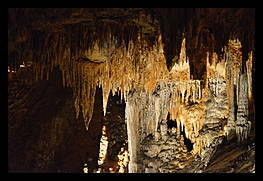 Luray Caverns is one of the most impressive caves on the east coast with lots of different types of rock formations. 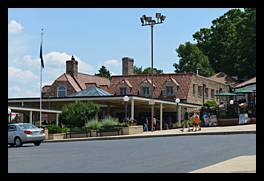 Luray Caverns is located in Page County Virginia right on Lee Highway (US 211) about an hour and a half west of Washington, DC. 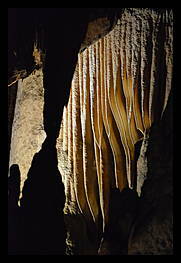 This is the main entrance to the caverns, you get your tickets and line up for the tour here. 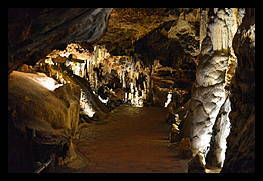 This path through the cavern, this area is brick. 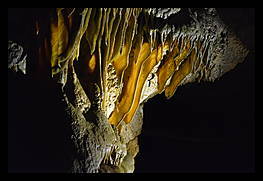 This rock formation is called the fish market because the layers of rock resemble fish hanging up. 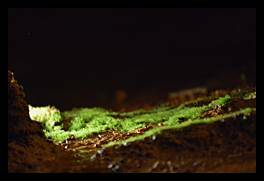 Since the lights in the caverns are on so much of the time, moss and algae grow near the floodlights. 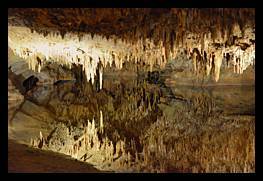 One of the coolest features of Luray Caverns is called dream lake. It is a shallow, calm lake fed by an underground spring. 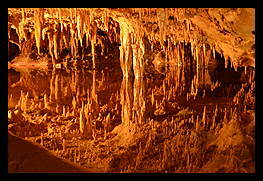 The mirror-like surface reflects the stalagetites on the ceiling. The reflections make the lake look really deep but in reality it is less than a foot deep. 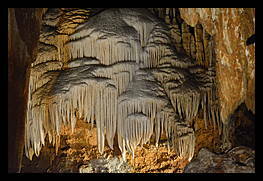 Although this looks like sharp stalagmites pointing up, it is really the reflections of stalagtites on the ceiling. 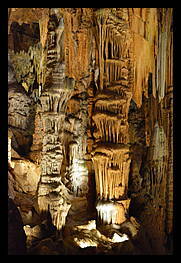 Dream lake was my favorite part of the tour, here you see not only stalagtites, but also some columns that go all the way down to the water. 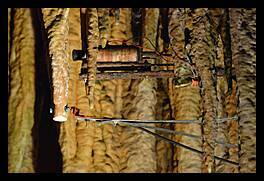 The cave isn't really orange here, the camera just didn't get the metering right. I like how it turned out though. 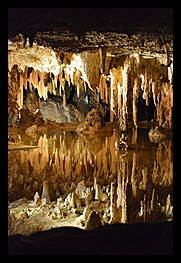 The stalagtites reflecting in dream lake here aren't as numerous or as sharp as in other places. Towards the back you can see the lake bottom showing through the water, and at the top left you can see a concrete walkway along this side of the lake. 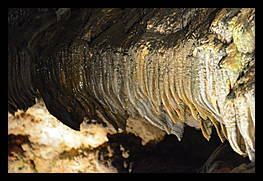 The edge of the cave wall has a ncie ribbon formation here. The lighting is strong enough that you can see that the ribbons have bands of color. You can also see some green algae growing on the constantly wet rock. 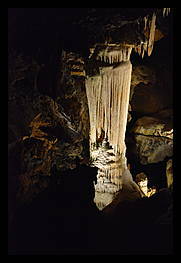 This large white column is visible from several places on the tour. Named after the fairy queen in Shakespeare's A Midsummer Night's Dream, this white calcite flowstone contrasts with the darker flowstone around it. The end of the long fingers of this frozen waterfall. This frozen waterfall wraps around almost 360 degrees. 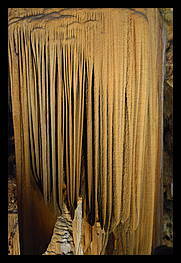 It is one of the most perfectly formed natural flowstone draperies in the world. 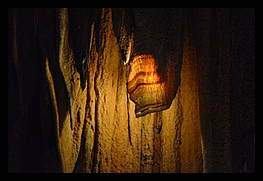 This small curtain of rock is thin enough that you can see light through it. You can also see how there are bands of darker stone running through it. 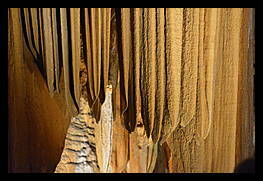 This room in the caverns is known for its totem pole like columns. The stone appears like water frozen on a cold winter day, it almost seems to be flowing. 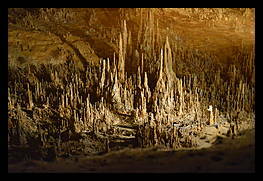 One of the attractions of Luray Cavern's is an underground organ that makes music by striking rubber hammers against stalagtites. The stones have been carefully tuned to produce different notes and the sounds are picked up and amplified for you to hear. 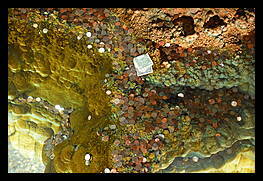 There is a small pond, about three feet deep along the tour route that they encourage you to make a wish and throw money into. Periodically they collect the money and donate it to charity. There were a surprising number of soggy dollar bills in the well. 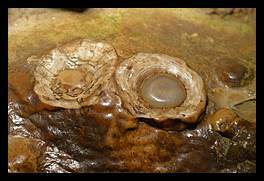 This stone formation looks like two fried eggs, sunny side up. Apparently the center part was originally yellow, like the yoke of an egg, however thousands of people would rub them for good luck as they walked by and the yellow color wore off. I don't know how long ago that was, but I first went 30 years ago and they weren't yellow then either. 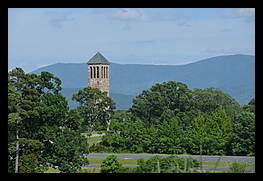 Back above ground, looking from outside the main building towards the appalacian mountains.